The Team Foundation Server (TFS) version 2017 and backward compatibility to version 2015 are supported. BPM-X® reads process documentation like BPMN process flows from Visio®, ARIS, Sparx or other tools to generate test cases in TFS. If business (functional) requirements or risks are models they are processed as well for having an automatically generated requirements (risks) coverage map. This requires to define a project in TFS using the CMMI workflow. CMMI workflow includes work items such as various requirements types. Examples are Business Objective, Feature (default), Functional, Interface, Operational, Quality of Service, Safety, Scenario, Security. Risks can be customized as a special Requirements type, e.g. to describe financial risks for segregation of duties (SoD). BPM-X® uses the TFS REST web services to load the test cases generated from the business process documentation into Test Suites of TFS. For each process model (diagram) a new Test Suite is geneated and all end-to-end Test Cases are loaded into the Test Suite. The Test Cases includes all Test Steps (also called sometimes test script). The requirements are linked to the Test Case supporting a specific requirement. This is the basis to generate coverage maps of requirements, Test Cases and Defects (bugs). This linkage of modeling tools and TFS saves up to 80% of manual developer or test engineer work and is incorporated the agile development processes as a DevOp. 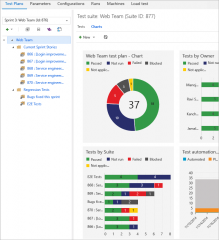 Sprint cycles require quick turn-arounds of the application testing. The concept of model-based testing supports the paradigm of model-driven, agile development. Therefore regression testing becomes less painful by re-using existing documentation assets and change impact analysis. To test not to less, but not too much.